Owning a home care agency means asking some hard questions. Should your home care agency move into the street-side office space? How do you rationalize upgrading your home care software if you’re paying nothing today? Should you spend $3K to wrap your car (as long as your spouse agrees!)? When do you know it’s time to hire a salesperson? All of these questions can be answered by looking at two simple numbers. LTV is the gross revenue earned for each customer. Knowing this number will give you confidence in how much you’re willing to spend for each incremental client. (Remember, you’re trying to understand if you should hire a salesperson or purchase software that will scale with your business.) Since home care agencies work with the adult-disabled and elderly, the hours for each client will vary widely based on the client's health. So how do you know how much the average customer will earn? If you’re the home care agency owner, this number is what you think about all the time. Gross Profit Margin is the percent of revenue remaining after all operating expenses, including your salary. This is the number that you think about when wondering if you can make payroll, pay the mortgage, or if you can afford to invest in your business. The three big expense line items for private-duty home care agencies are typically payroll, rent, and insurance. For every dollar earned in home care about 2/3 of it is spent on these expenses, resulting in an average GPM for home care agencies of about 33%. This means for every dollar that passes through your agency, 66% is sucked up into your expenses and 33% is left as pre-tax profit. 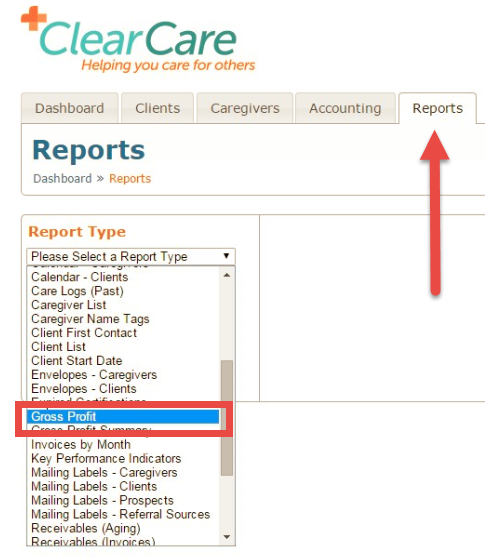 Agencies using the ClearCare home care software system can find these numbers easily using the Custom Report tab. Find the Rev/Profit by Bill Rate report (see below) and then select a time period. 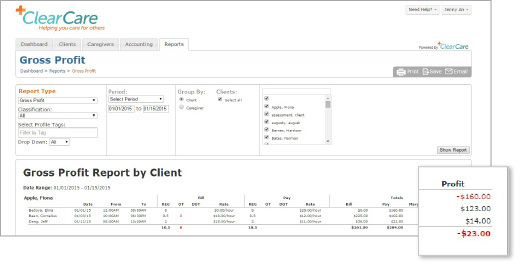 Pull the report for all of your bill rates or isolate hourly versus live in using the ‘Group By’ option. You’ll then see a rolled up summary of your LTV and GPM. Your GPM may vary. 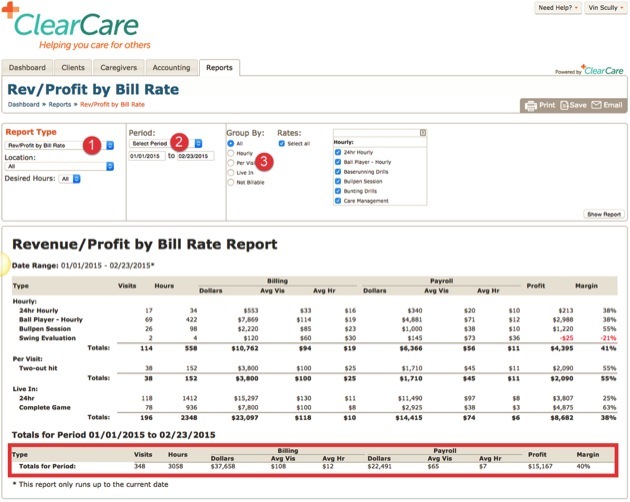 If you're a ClearCare customer today you can find your Gross Profit Margin all the way to the shift level. See below for instructions. With these two numbers in hand, you now have a framework to answer most investment decisions for your agency. For example, let’s say your LTV is $10K and your GPM is 33%. This means that the average customer earns your agency $10K in gross revenue and, after your expenses, $3,333 is left as gross profit before paying taxes. How much should I be willing to pay a top marketer? 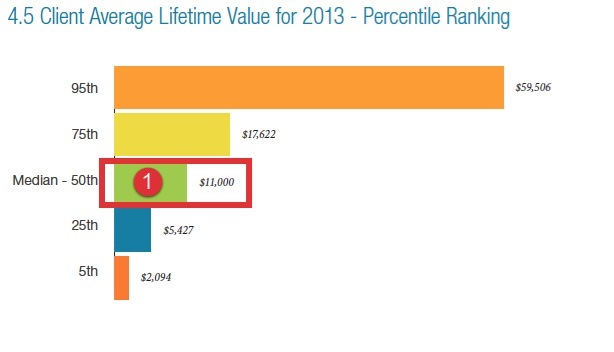 Let’s say the cost of a marketer including salary and bonus might be $100K. That might seem like a lot, but using our LTV/GPM framework, you know this marketer needs to earn 30 incremental clients in a year to pay for themselves. $1K on leads each month (or 40 leads) means you only need to close one incremental client (since $3,333 is greater than $1K). When the phone rings, how much revenue is calling? Hint: this is your LTV. That's $3,333 calling! Should you spend $3K to wrap your car? If you receive 1 incremental client from this, then it could pay for itself. How much should you spend and how long should your marketer call on a major referral source that has 20 discharges each week? If one referral source sends you one referral each month that’s $3,333 x 12 = $39,996K of referrals each year! One of the biggest issues agencies face when marketing their business is under funding their business. Using LTV and GPM provides your agency a framework to make smart financial decisions for your office. 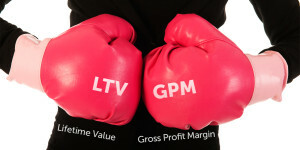 How else could you use the LTV & GPM one-two punch to make decisions in your office? Not a ClearCare customer and want more information on LTV and GPM reports? Contact us at (800) 449-0645. Already a ClearCare customer and want to consult with a customer support representative who can help you generate these reports? Just contact us at support@clearcareonline.com.